Easter is almost upon us which means it’s time to decorate some hard-boiled eggs for no apparent reason. To keep the mess to a minimum you can buy an Egg Bot machine that automates the process, but if you’ve already got a Lego Mindstorms EV3 kit at home, you can just build one yourself. 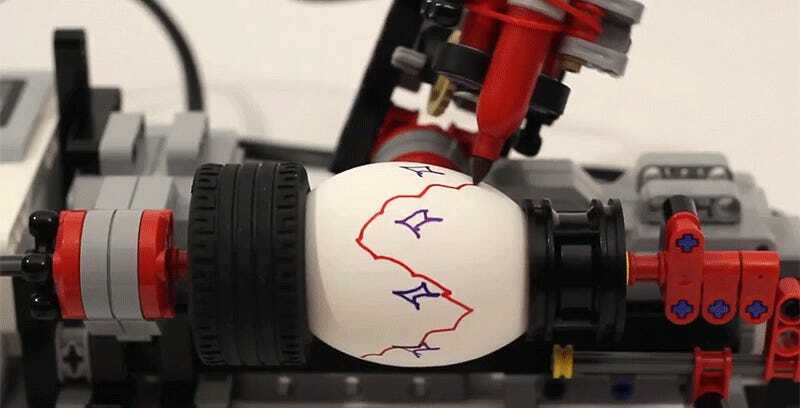 Jason Allemann’s EV3 Egg Decorator isn’t the first Lego creation that automates the process of turning a hard-boiled egg into a work of art, but he always goes the extra mile to post the full build instructions and programming code on his JK Brickworks website if you want to build your own. You’ll also need to supply the Sharpie permanent markers yourself, but that gives you the opportunity to customize the colors of your designs.